MU Sustainability is excited to announce that Mizzou will be participating in this year’s competition and we’re hoping to be the best recyclers in the SEC as we go up against the University of Kentucky and University of Tennessee! The competition will begin Feb. 1 and end March 30. 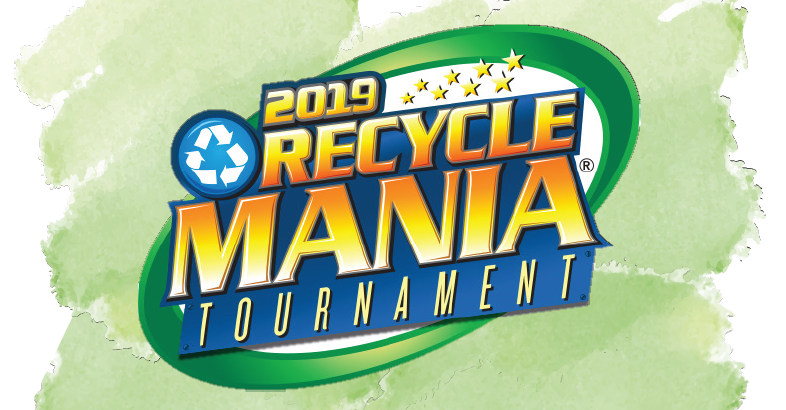 To start the competition off, we will hold our Recyclemania Kick-Off tabling event on Monday, February 4 from 11 a.m. to 1 p.m. at the MU Student Center room 2206 ABC. There will be prizes, games, recycling info and so much more! Also, be sure to visit our recycling pages so you are up-to-date on how to properly recycle/dispose of your waste before, during and after Recyclemania. Come out to the Hearnes Center on Saturday, Feb. 16 at 2:30 p.m. to see MU’s wrestling team take on Oklahoma State and to also help us with our Game Day recycling efforts! MU Sustainability and Sustain Mizzou will be handing out information on how to recycle and we’ll be ready to answer any questions you may have. The recycling bins dispersed throughout the building that day will be weighed and counted toward the Recyclemania competition, so let’s show the 300+ other colleges what Mizzou can do! The Environmental Protection Agency estimates that Americans collectively dispose of about 12.8 million tons of textiles each year. Donating and swapping your gently used clothes, as well as shopping from used clothing stores, can be a great way to help divert these textiles from the landfill. 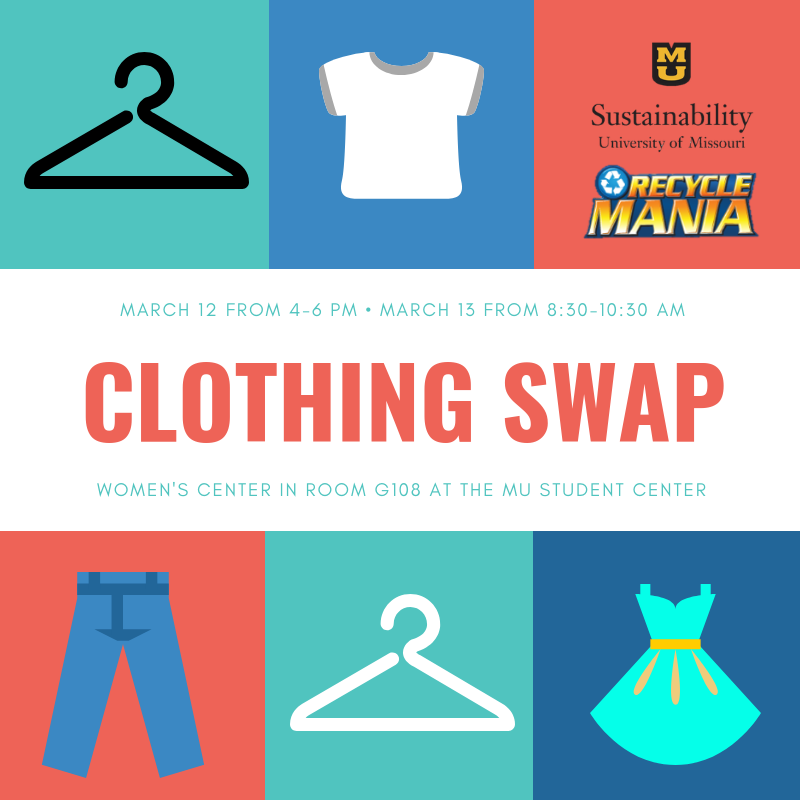 To help do our part, MU Sustainability is holding our seasonal clothing swap on March 12 and 13 at the MU Women’s Center. Be ready to recycle and swap your clothing for some “new to you” pieces as well as gather info on how to keep boosting your recycling efforts after the event. This swap will be open campus-wide for students, staff and faculty to participate. We ask that ALL donations are clean and gently used. We will accept junior and adult-sized shirts, pants, skirts, dresses, blouses, shoes, coats, jackets, athletic wear and scarfs. No undergarments and socks. Donate as a club/organization: Is your club or organization interested in gathering gently used clothes before the Clothing Swap begins? Between February 22 and March 4 we are encouraging clubs and organizations to download our Clothing Swap Tracking Sheet, log how many clothes each team member has donated and then email us your final numbers by March 5 at 5 p.m. Teams can then drop-off their donations between March 6 and March 8 at the MU Sustainability Office. We will use the tracking sheets to know how many clothes each individual can pick up the day(s) of the event. Bonus: With this option, the team that collects the most clothes will have the chance to swap before the doors even open! We will contact the winning team as soon as the sheets are all tallied! Details of how to swap ahead of time will also be emailed to the winning team. Donate at the event: Bring your clothing items to our check-in table the day/time listed above. We’ll write down how many items you brought in, you’ll receive a ticket with your donation amount written on it and you’ll be ready to swap for that same number of items. Take your items and ticket to the check-out table and you’ll be ready to go with your “new to you” pieces! Donate, but don’t participate: Are you interested in donating your gently used clothing items but not interested in swapping out for “new to you” pieces? Contact our office at 573-882-8207 or musustainability@missouri.edu. The ability to collect clothes prior to the event will vary on space and availability.